HomeBlogMirror, mirror, on the wall…. Mirror, mirror, on the wall…. I was standing in front of the mirror in the dressing room in the upscale department store, looking at the reflection of the pretty, fit and lean brunette in a beautiful cocktail dress. She turned right and left in front of the mirror, trying to find the usual flaws in her appearance. The mirror was true to itself and continued reflecting back an attractive body standing in front of it. I was surprised, because only couple of hours ago in a different mirror this very same body didn’t look as lean. In another mirror the image was that of a shorter, stockier body, not the one I so wanted to see…. I turned around again…. Sigh…. It downed on me that perhaps a store was using ‘skinny’ mirrors. 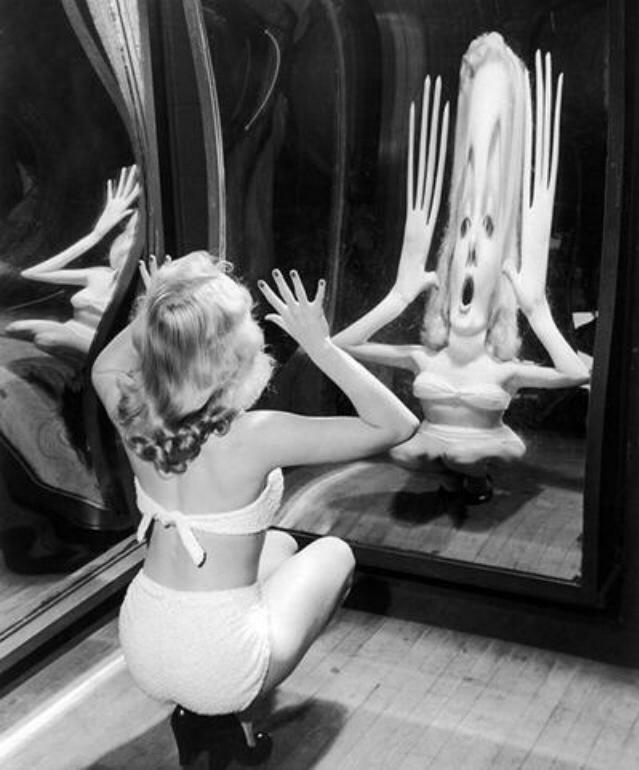 People would look thinner and more attractive to themselves in their mirrors, and would purchase more clothes. I walked out without a dress. I didn’t trust the mirror there to buy this dress. How often would I buy something that looked so good on me at the store, but looked awful at home!.. Then it downed on me… How can I possibly know the truth? Which mirror is saying the truth? The skinny one or the fat one? The reflection in the mirror is just that! A reflection! An Illusion! Neither one is truth! How many unhealthy decisions are made daily by thousands….millions?!?! of women based on believing this reflection, which is being seen through the filters of our perception of ourselves? The perceptions and expectations of the society? The perceptions and beliefs of our unworthiness? How often did I avoid looking at this mirror avoiding being disappointed in myself…. Ladies!!!! This mirror thing is NOT a true representation of who you are, or even what you look like! You are magnificent, gorgeous, amazing beings! Worthy of love and appreciation! Worthy of adoration! You are a miracle! and so am I! Latvian-born Faye Kitariev is an inspirational speaker, bestselling author of “Choreography of Awakening”, and performance mastery coach. She is a former US figure skating coach and choreographer. Faye trained, choreographed, and inspired numerous national and international skaters, including US national champion and Olympic Silver Medalist Sasha Cohen and World Bronze Medalist Johnny Weir.